Vista. CA –I lost my best friend on April 6th. This was a friend like I will never have again. He was a big boy; had black, grey and white hair; seemed to always know what you were thinking; he was a very good communicator always letting you know what he wanted, and he was a bit cantankerous and stubborn. He didn’t ask for much, just a couple of meals each day, water and treats, boy did he like treats. I think the most amazing thing about my best friend was his unconditional love. He didn’t care what mood you were in, because he had the most uncanny ability to always cheer you up. The way he would stare you down, with one brown eye and one blue eye, would always bring a chuckle. Then there was the different barks and noises he would make. Lying in front of the T.V. when he needed something, there would be a series of low short “ruffs”. If you ignored him, the “ruffs” would turn to slightly louder barks. This usually would mean one of three things; I need attention and a nice rub down or would you please take me out to pee or I need a drink of water. He developed these over the years and we began to learn how to interpret what he wanted. As he got older, the attention barks occurred a little more often as he was finding it difficult to scratch his nose or ears and liked it better anyway when we did it. At dinner time, a ritual developed involving me asking him if he wanted to eat, a series of barks would follow and a venture into the living room to grab one of his collection of squeaky toys. Dinner was his favorite time. My friend always wanted me to take him to our local community park. It’s that communication thing again, him always knowing what I was saying and then responding. All it took was a quick, “Want to go to the park” from me, a series of barks from him and off we would go. As he got older I had to use a ramp for him to get into my big red van, then my wife’s Venza. Even as his arthritis became worse, going to the park was something he looked forward to. After all there were smells on top of smells, a multitude of places to pee and the park was a good place to take a poo. Again, in his younger days, running after the ball and bringing it back for another throw was an activity he looked forward to. As the days and years grew longer, running was no longer an option, but getting his red ball and strolling around the park was still something he enjoyed, even up to the next to the last day of his life. We almost lost him a couple of years ago to another ailment, but with help of the vets he fought thru it and returned to the routines he had established; but I think he knew he was living on borrowed time as he began to stay closer to us. He would follow my wife each morning into our side yard to smell the flowers. We joked he was becoming Ferdinand the Bull, wandering through the plants and making sure he didn’t miss a smell. In the house he always wanted to be near us as he would lay on his rugs and dog beds as he watched T.V. with us. In his younger days he loved water, especially chasing after it when you brought out the hose and squirting it around the yard. He and his sister would chase it until they were completely soaked. We certainly never had a problem bathing them. There is no question this special friend had complete run of our house. When he was younger, he and his sister both controlled what went on in the house. There was not a piece of furniture they hadn’t jumped on or slept on. He lost his sister a few years ago and went through a mourning period, but once he realized he now had total control of the house, he developed a wonderful “I’m in charge” attitude. Anyone who visited or called our home knew this as he always became a part of the conversation adding in a series of barks to go along with what was being said. Everyone loved my friend. Young children would always comment on how soft he was and adults would say how good looking he was. My wife, Carolyn, and youngest son, Brian, love my best friend as much as me. My son would always take care of him when we travelled and he developed a special bond, so much so my friend would break into a “happy to see you” barking fit when he saw him. Through the years he also had special friends, like the boxer that used to live next door or the lab that used to live across the street. His best friend was a Pomeranian, named Luke, who lived down the street. He loved going down the street to Luke’s home because Luke’s owner would allow him to wander her house, checking every room out, playing with some of Luke’s toys, and oh yes, there were treats to be had. Around my home, my good friend developed a series of paths he would take when he was allowed out front. These paths led to places he liked to smell, always marking his territory. The path he would choose would slightly vary each time, depending on what direction he felt he wanted to take that particular day. He was allowed to pick the path, I simply followed. You knew when he wanted to go out usually from a stare down or some quiet barks. Over the last few years this became harder for him as his arthritis became worse, even stopping him from going up our stairs to our bedroom, a place he like to go to stand out on the balcony. Getting up was a bit of a struggle, even to the point where the family would have to occasionally help him. Once up, nothing was about to stop him from getting where he wanted to go. We use to joke that he and I were the same, we both had trouble rising and beginning our next step. My best friend made it to 13 ½ years of age or roughly 94 human years. Not a bad life. It was still hard to let him go when what seemed like a stroke struck on the morning of April 6th. The veterinarian hospital doctor listed some options we had, but none seemed likely to help. Our families painful discussion centered on quality of life and what would be best to take the pain away for our incredible family friend. So we decided that the most humane choice for my best friend Sydney, also known as Bubby or Bear to me, was to let him go with a dignified death. The dog I loved more than anything else (not counting my wife, kids and grandchild) would no longer be a part of my life except thru memories. Without a doubt, the hardest decision I have had to make and I know the hardest decision many of you make with your special friends. My dog, Sydney, and my love for him will always be with me. I find myself walking past places where he would lie in my home and I look for him. The house seems quieter now. 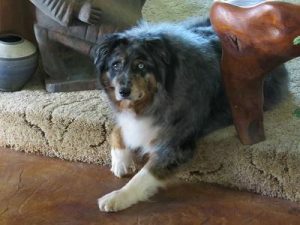 We are starting to cry a little less, but it is still hard to tell people Sydney is no longer with us. Maybe we will get another friend someday, but for now the pain is still with us and we are still dealing with the change in our life. My son Brian may have put it best on Facebook, Life is Ying and Yang, Ups and Downs – we are down right now, but the memories are good and help heal the pain. I lost my best friend on April 6th, a day I will always remember for the painful way it began and the beautiful way it ended, celebrating my 45th wedding anniversary with my wife. TR: I know what you went through when losing your dog it is one of the most emotional feelings that you go through in life. A dog is a part of your family and you always treat them like a baby. I feel like a little kid when I am around dogs a lot and have lost some while living in Delaware. When it comes to the death of a loved one or a pet the best thing to say is to read the 23rd Chapter of the Book of Psalms in the Bible and it tells what death is all about. I will keep you in mind and thought. Mr. Robertson, my thoughts are with you in the loss of your best friend. Somehow they quickly find their way into our hearts and lives. Unfortunately our best friends don’t live as long as we hope. Having just lost my best friend a few weeks ago, I understand your pain and hope you find comfort in your happy memories. Our beloved Bella has been gone for over 30 years, but there are still many moments when her memories come to mind. She was a “perfect dog”, never any problem, and so many of our friends and neighbors still mention her at times. A small part of the heart has not mended.